Amuse Basic was established in the Pacific North West in 2017. Its origin was a thorough rationalization of the manufacturing process with an eye to creating simple, low-cost, good quality products. Specifically, we reexamined products through three lenses: material selection, inspection process and packaging simplification. In notable contrast to the prevailing over-embellished products in the marketplace, Amuse Basic's products both won great appreciation and sent shock waves across the world. Amuse Basic home products are succinct, but they are not in the minimalist style. Simplicity and emptiness yield the ultimate universality, embracing the feelings and thoughts of all people. We have been credited with being "resource-saving", "low-priced", "simple", "anonymous" and "nature-oriented". Excellent Gift Option - for any festival and anniversary like Halloween, Thanksgiving, Christmas, Wedding, Housewarming, Baby showering, Graduating, etc. Send the most beautiful gift to the one you loved. These attributes can be noticed by our line of products, which are designed with the utmost quality with focus in sustainable sourcing practices. This includes Plastic ware from Belgium, professional porcelain accessories from Asia, Soy Candle handcrafted in Canada among others. 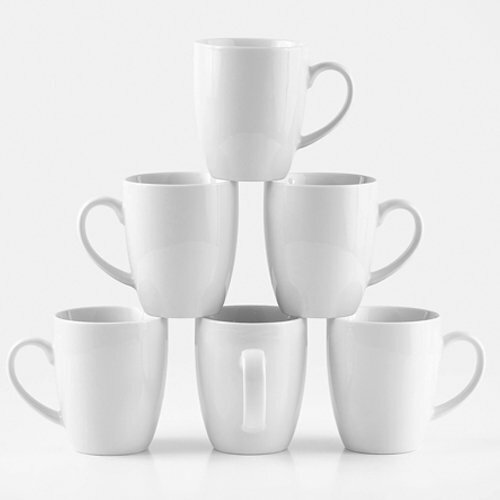 Incredible Value: Set of 6 Pure White Mugs. 100% Lead and Cadmium-Free. Imagine serving coffee or tea using mugs from famous coffee shops such as Starburcks, Lavazza, Illy, Cafe Nero, Coffee Bean & Tea Leaf and Costa Cafe. There's plenty of room between the handle and cup itself, with the well-shade handle, so comfortable in the hand that makes the tea & coffee taste even better. Just like restaurant´s mugs: Our Mugs are Extremely Durable because they are made from professional grade porcelain. Dishwasher, Microwave and Oven Safe. 30 Day Chip-Free Guarantee: Amuse Home will offer a free replacement or refund if anything goes wrong with the product. If you have any questions about this product by Amuse, contact us by completing and submitting the form below. If you are looking for a specif part number, please include it with your message.